Table toppers Linfield came out of the blocks quickly at Stangmore Park, with Waterworth handing his side the lead in the seventh minute. The blues striker quickly doubled his team's lead in the 11th minute, before defender Jimmy Callacher made it three in the 25th, with his tenth goal of the season. Waterworth grabbed his hat-trick in the 56th minute, before grabbing a fourth in the 72nd. The Linfield talisman was given a rest by manager David Healy, who subbed him off after his heroics. Dungannon were up against it from the start and rarely threatened Linfield's dominance. 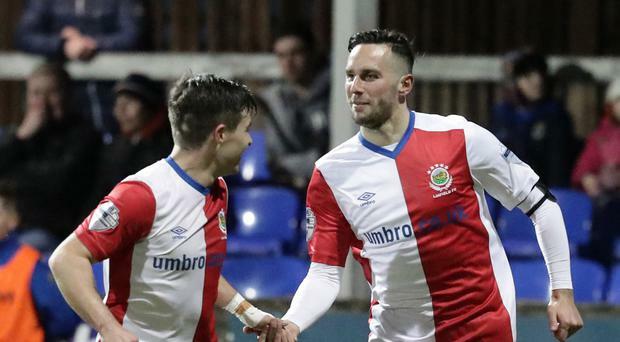 The result leaves Linfield nine points clear of nearest challengers Ballymena United at the top of the Irish League table, though Ballymena have a game in hand.